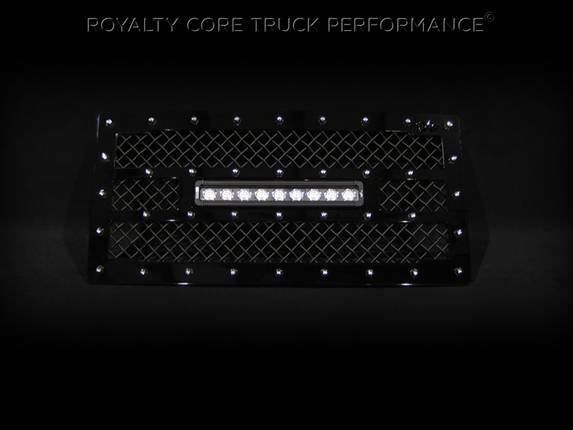 Royalty Core's Incredible RC1X Grille features an integrated insanely powerful double row Vision X Xmitter LED light bar bordered within the grille design and mounted in a closed loop adjustable system. Each corner of the grille has flares with dynamic cutouts to compliment the LED horizontal bar with Royalty Core's RCX Logo machined on the frame. This grille includes a 12 inch Vision X Xmitter LED light bar. Including a weatherproof Deutsch connector with plug-and-play, polycarbonate lens, and isolated rubber mounts for vibration control. An updated multi-volt electronics increase output with a seamless beam pattern featuring a 50,000 hour lifespan. Being manufactured from extruded 6061 aluminum, the Xmitter is tough enough for all conditions. The front has the ultimate protection of the unbreakable polycarbonate lens, while the bottom has the Vision X trunion bracket for mounting. Each grille has been rigorously tested by Royalty Core engineers to maximize protection, appearance, and performance on and off-road. Lab tried with rapid salt and chemical spray tests proving the most resilient grille on the market against the harshest conditions. Simple direct bolt on Royalty Core grilles are engineered to exploit the cleanest installation possible for your specific truck model.